I'm setting up new planted tank. It is a 12g nano cube. I'm on the second week of my fishless cycle. It seem to have cycled in just 9 days. On day 1 I added pure ammonia to 5ppm. Ammonia dropped to 0 on day 3 and nitrite spiked to 3ppm on that day so I lowered my dose to 3ppm of ammonia. Then on day 6 nitrites dropped and nitrates raised just a little from 20 to 40. I kept adding ammonia up to 3ppm and on day 9 the ammonia was down to 0 within 24 hous so I thought the tank was cycled then. I kept adding ammonia everyday to 3ppm as I did not get a chance to get my fish yet. On day 12 I noticed ammonia didn't drop to 0 but it stayed at 1ppm. I'm on day 14 now and I have not added any more ammonia but it is still reading 1ppm. because I was waiting till a day before I get the fish to do a 50% water change. My question is, does this mean the nitrogen cycle is not done yet or is there something else I need to do like a pwc to get the tank back on track? 3 river rocks for decor, 2 plants, and aqua chargers for biological filtration. Also the tank has sponge filter and activated carbon which I plan to remove once the nitrogen cycle is complete. Any ideas and advice will be appreciated. Hello Bob Fenner, thank you for the prompt response! I just have a few questions. 1 what will the baking soda do to the nitrogen cycle, and do I add it to the main tank or the filter area? 2 what do you mean by the forestalling with the driftwood and the aqua chargers? Right, I'll ask the quick one first. I recently bought a new 70 litre tank and it came with whatever Tetra's version of tap safe is, a small tub of food and some mystery product called "Easy Balance" that claims I only need to do water changes once every six months if I use it. It also seems to "stabilise pH and KH". Is this stuff snake-oil, consignable only to the bin or is it worth using it until the bottle is empty? I'm always hesitant to believe extraordinary claims and anything that mucks with my water chemistry makes me uneasy. I won't buy any more of it, anyway, since I'm not paying for something that elbow grease can accomplish just as easily, just curious. I know it's a risk but I am keeping a really close eye on them and have backup nanos to use as hospital tanks or outright isolation tanks. So far, I've not seen any real open aggression, just a few nips, chases and a bit of flaring. No worse than Danios, so far. Fingers crossed! I've got some lovely specimens too, with some of them really similar in colouration to wild betas. Into this new tank went a mature bubbler filter and a new All Pond Solutions 600 litres per hour internal filter. I rubbed the wetted media from the 600lph over mature filter media from my other tanks. The media from each mature filter was also rinsed in the new aquarium's water with the "pumps running". I want to go with the 600lph since the trick to this setup seems to be slight overstocking to disperse aggression. I thought over filtering might not be a bad plan in this situation! I didn't expect the bubbler to keep up with 8 female betas in a 70 litre tank, but I didn't expect it too be too harsh on them either, especially with frequent partial water changes (plan was 10% per day, depending on analysis) and light feeding. Sort of an "assisted" fish in cycle. Well, it seems like the bubbler is keeping up after all, two weeks in and not a jot of ammonia in my daily tests. I'm now feeding normal amounts and doing my standard 20% weekly water change. The issue I have is that I'm not sure how long to leave the bubbler running in parallel with the new filter. Normally I'd set up a tank with a new filter, go fishless and be able to monitor the cycle but this isn't really an option here. Just as an aside, so far I really like these internal filters from All Pond Solutions for Betta setups. They come with an optional spray bar that you can adjust the angle of egress on. The spray bar really reduces the force of water and with the outlet holes angled toward the back of the tank it does so even further. I have another smaller one cycling in another tank to use with my male Betta. I can get rid of the ugly home-made baffle on the outside of his internal filter soon. Still, they are dirt cheap, so I'll be interested to see how much life I get out of them. Anyroad, thanks for any advice you can give, both on the new filter cycle issue, the Easy Balance and anything else you might spot that I've overlooked. Also, thanks again for all the help you've given me in the past. Thanks for your input. I always like an experiment, so I might just do that! I'll stick the bubbler in it's final destination (a soon-to-be cherry shrimp nano) and once I'm sure the Bettas are fine then go ahead with that. Thanks again, your advice and reassurance is very much appreciated. Does Dr tims one and only work, Does anyone know this for sure?? Thanks I am sorry to have to mail again but I cant read or find what I need anymore, MY EYES are burning!! wow you know dr Tim personally!! even if I didn't use old media will it work as well?? Will I have ammonia problems, What can you tell me about this one and only?? How does it work where others don't at all!! I have a 10 inch freshwater Plecostomus in a 55 gallon aquarium. To make a long process into a short story, I bought the entire setup piece by piece (with the help of an aquarium shop owner) and achieved pristine and balanced water, all in preparation for a fish to come live with me. He was a 10 inch African Cichlid who had been living healthfully for years in a friends tank and this friend offered the fish so he could change his scenery a bit (the friend's). He arrived here on a Friday night in a large cooler of his own very well-kept aquarium water, and by Saturday night he had died. Although his color returned to full strength an instant after being placed in the new tank, as time wore on he rapidly deteriorated. His symptoms included a white wispy film flowing from his fins, clouding his eyes, and disintegrating the tips of his fins. He was lethargic at first, being less active than usual, and then he began resting his belly on the bottom of the tank, and gradually he seemed to have difficulty holding his body perpendicular to the tank floor. When I began noticing this white film forming 10-12 hours after his arrival I called the Aquarium-owner friend and he recommended I check his water temp and bring it up from 68 degrees F to 75-80 to help him heal, and to go purchase some anti-fungal medication. I did this approx. 6 hours before he went belly-up. Now my Plecostomus has the same white film, lethargy, difficulty breathing, a slight reddening of his scaled regions and is unable to hold himself up on the glass (there are some bubbles at the top of the tank now but I was told that is probably from the medication). I've put "Lifeguard" tablets in the tank (an antibacterial and antiparasitic) as well as added 4 rounded tablespoons aquarium salt. 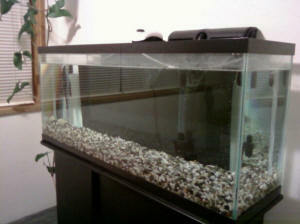 This tank has a 50-60 gallon dbl-headed water filter, a 200 watt heater and a complete undergravel filtration system. Oh and the Pleco had been doing beautifully the 3 weeks he was in the tank by himself before the cichlid got introduced (we did that so that the cichlid wouldn't beat up the Pleco, or if he did the Pleco would defend "his" territory and not let himself get injured too badly, since the cichlid wasn't very friendly with other tankmates). adding 10mL per 10 gallons on the first, seventh, and fourteenth days. This was to remove chlorines and chloramines and develops biological filter (by adding beneficial bacteria). 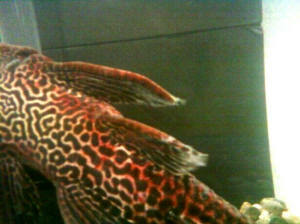 Unfortunately the Pleco "Leonardo" died last night not long after I sent you those pictures. It looks like I would benefit from some "How to clean your aquarium after fish death to prevent it happening again" advice, if you will. I'm going to study the white film on Leo's fins and see if it is a fungal or bacterial growth. I'm a medical student rather used to culturing gross stuff, and I had some sterile swabs and specimen tubes handy. I'll let you know how they test. The Stress Zyme says "Contains Live Bacteria". And two weeks wasn't long enough? Leo was doing fine for the 2 week he was in there alone: water was clear, he was active and a healthy color. That is a very cool degree, and I'm glad you have a site like this to help us beginners. I am not adverse to further reading on aquarium preparation, but please understand I invested in an aquarium to have a pleasant living room de-stresser (Finals are in two weeks). I will do as you suggest and let the filters run for now. I thought I was taking every precaution possible with this attempt, and the water was perfect until something in/on the cichlid came into the tank. Well anyway thank you for the advice; I'll read some freshwater aquarium husbandry books over Christmas break. Benefits: Contains millions of live bacteria that speed up the development of the biological filter to eliminate ammonia and nitrite. When to use: Whenever setting up a new aquarium, and use weekly to maintain fresh water aquariums. New Aquariums first use: use Stress Coat (the other bottle in this kit) to remove chlorines and chloramines. Next, on the 1st,7h, and 14th days, add 10mL of Stress Zyme per gallon of aquarium water to establish biological filter. Thereafter and existing aquariums: to maintain good water quality and healthy biological filtration, add 5 mL of Stress Zyme per 10 gallons aquarium water weekly. could have been caused by. Please let me know if you have any more ideas on what may have gone wrong. <Hello Laurene. The problem with these "instant cycling" potions like Stress Zyme is they're not terribly reliable. They're like stain removers that promise to clean your clothes from ink stains and such: sometimes they work, but sometimes they don't. So most of us who've been in the hobby for a while don't recommend them. At best, if you use one -- don't rely on it. Add the instant cycling potion, and then add an ammonia source like a small pinch of flake. Add further pinches over the next week, and if you find ammonia and nitrite levels stay at zero, then all well and good. Add some fish! But if the ammonia and nitrite levels aren't zero, then the potion hasn't "taken" and the bacterial will need a bit more time. Carry on adding the pinches of flake and doing water changes. In all likelihood you'll speed up the cycling process because the potion will get things started, but you probably won't entirely eliminate the cycling process. By the way, once a filter is cycled, there's no need to add further Stress Zyme on a weekly or whatever basis. The manufacturers would obviously love you to, but the reality is that the filter contains a self-maintaining population of bacteria that will be optimised simply through proper maintenance. Alright, thank you for the advice Neale. Good morning, hope you are doing well today. I have one quick question. My 55 gal freshwater tank has been set up for about 2 weeks now with no livestock. I just purchased a bottle of Fritz Zyme #7 to aid in cycling the tank. I asked the LFS if I should dump this in the water and let it wait a week or two anyway before I add any fish and they told me I should add it at the same exact time as my fish. Something does not sound correct to me about this. Could you please help me out with the correct answer here? I am moving in a 6 weeks and wish to set up and cycle a new 55 gallon prior to transferring my goldfish. I have heard that one can use ammonium hydroxide to help establish the nitrogen cycle but I am not sure how much I should add to the tank. I will be seeding the tank with some cycled material so all I will need to do is add enough ammonia to establish the bacterial colony and keep it fed until I can add my fish. I have purchased a bottle of ammonia (ingredients read: water and ammonium hydroxide) but no molarity is listed. Should my goal be to add ammonia until I reach a certain number on my test kit or should I add ammonia based on the amount of water in the tank? Also, should I be monitoring ionized ammonia, free ammonia or just total ammonia with my test kit? Hi crew, the following is an Email I attempted to send Chris Cow Ph D.
Apparently his email is not working. Does anyone at WWM have experience with fishless cycling? Greetings , I read with great interest the Fishless Cycling article and wanted to share my diary with you and possibly get some feedback. My wife is the fish person while my involvement is setup and cycling. I have a broad mechanical/fabrication background and am enjoying learning about aquarium plumbing and function. We already have a 10 gallon setup that we will use as a hospital tank that currently contains 2 Cichlids. It turns out our well water is a natural for them ( Non chlorinated, high hardness/high pH). We recently acquired a 2' x 2' x 8' 200+ gallon aquarium free(should have been my first clue) from our neighbor. It was up and running until I moved it to our home on 6/1. After 2 weeks of work refinishing the base, building a new canopy, beefing up foundation, polishing scratches in acrylic tank, re plumbing pump and filters and overhauling the under gravel filter it was time to fill and cycle. Added 2 1/2" fine gravel over filter(filter covers the entire bottom with 3 evenly spaced 3/4"suctions in bottom of tank). Added 15- 6" x 8" x 4" rocks along with 2 dozen fake plants and a 48" air wand. This aquarium will be an all Cichlid No live plant setup. All test kits are by API and ammonia is 10%. Tank temp set AT 80 degrees. KH , GH , pH did not vary from beginning to end so I have omitted them from the daily readings. Green algae and brown algae(?) multiplying to cover all large rocks. Sooo I'm a little confused. Hardness and pH haven't changed, Ammonia has crashed, Nitrite seems to beholding at 1 ppm, and Nitrate seems to be wallowing around 10 to 20 ppm. Am I missing something or is this on track and just not done cycling ? Will the brown algae(Diatom? )die off or do I need to take action? Still having fun just want to make sure I'm not spinning my wheels. Thanks for the input. Your site and forum are far and away the best resource on the web. It has been in the back of my mind for a while that the amount of Ammonia I add every day could be overwhelming the biological filer, so unless you have reason to object, I think it is time to shift gears. The article says to do a 80% water change before adding fish so I'm thinking I could do this and at the same time reduce the ammonia added daily to 1 tsp. I will continue to test daily and also take your recommendation of 15% water changes weekly. If the Nitrite drops to Zero that should support the idea that the biological filter is either to small or not completely developed ( I lean toward the latter). My wife ordered (on hold) 60 juvenile - 1" Mbuna Cichlid : 12 Demasoni, 12 Electric Yellow, 12 Red faced Mac, 12 Rusty and 12 Obliquidens Zebra's from www.livefishdirect.com. According to the article the amount of ammonia we have been adding is well in excess of what a fully stocked tank will produce. If this is true 60 juveniles should be a small percentage of what the biological filter will eventually need to support. Assuming I do all the above how long should I wait to stock the tank ? I knew when I built the canopy that the lighting was overkill but I didn't want to build it twice and I wanted to allow for future possibilities. I will continue to research the under-gravel filter (thanks for the links). Assuming that the UGF stays what would your recommendations be for possible live plants to combat the Diatoms/Nitrate ? Hi Chris Saw my previous post(with your inputs) on WWM website. At the end of the post "RMF" added a comment to the effect that I should stop adding ammonia altogether. Tests on 7/10 thru 7/12 show 0 ppm Nitrite and 5 ppm Nitrate. If this continues it is my intention to stock the tank on 7/17. My question for you or any crew member with Cichlid experience is about the manner in which I stock. coexist successfully and to introduce them all at once. From what we read this leads to less aggression and attrition. What are we missing in this equation? Once again I thank you for your patience and help. Thanks so much! Will go with adding flakes starting tomorrow. And yes, the plan is to stock all 1"/1.5" juvenile fish. Once again, we think that you have one of the greatest sites around for information. We spent many hours reading WWM prior to doing anything to setup this tank and I am certain that the information we have gleaned will keep us out of trouble.